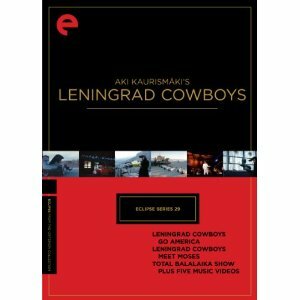 The Leningrad Cowboys began with music videos, which was how filmmaker and master of deadpan comedy Aki Kaurismaki discovered them. Directing music videos of his own as well as two narrative films about the fictional band, this despite being called “the worst rock-and-roll band in the world” resulted in success for the fictional band, and resulted in tours and a final collaboration with Kaurismaki in a concert film. All three films and the music videos are included in this collection. After the first three music videos, the Leningrad Cowboys made a cinematic introduction with the successful deadpan musical comedy, Leningrad Cowboys Go America. The Siberian band sounds more polka than rock, so they are somewhat unprepared when they arrive in the United States for their international musical debut. The one thing that they do have going for them is an unforgettable style. All of the members of the band (and there are a lot of them) wear long pointy shoes and have hair that comes to a point in the front also. These elfishly dressed Siberian musicians quickly learn rock-n-roll for their American tour, which ends in Mexico with a gig at a wedding. Before reaching their destination, the band finally comes to the realization that they are being abused by their manager, Vladimir (Matti Pellonpää) and revolt against him. At the end of the first film, Vladimir walks off alone into the Mexican desert. When he returns in the much anticipated sequel, Vladimir insists that the Leningrad Cowboys call him Moses; hence the title, Leningrad Cowboys Meet Moses. The sequel is a darker and stranger film, which Kaurismaki claims is based on the Old Testament of the Bible. Many of the members of the band are dead after too much tequila, and the survivors quickly fall back into the manipulation of their former manager, now turned prophetic. He leads them back to their homeland in Siberia for a homecoming tour, also bringing the pursuit of a CIA agent when Vladimir/Moses steals the nose off of the Stature of Liberty as a souvenir. includes 150 Alexandrov Red Army Chorus and Dance Ensembles members performing with the elfish rockers. They play many of their classic adaptations, including Bob Dylan and Lynyrd Skynyrd.